MEATliquor was a burger restaurant located in a parking building off Oxford Street. It closed down in February 2019, though other branches remain open. A feted burger restaurant located in a parking building off Oxford Street, just behind Debenham's, in Marylebone. 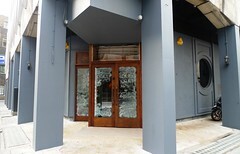 It opened on 8 November 2011, replacing an Italian restaurant on the same site. The genesis of Meatliquor is a mobile food van, the Meat Wagon, which sold burgers in various locations mainly around South-East London, but also in pubs and venues further afield around the capital. An association with Capital Pub Co, and the theft of the first van, led to the #MEATEASY pop-up in their New Cross pub The New Cross House. The popularity of the Meat Wagon and its subsequent incarnations has always centred around Twitter and other social media (hence the hashtag name for the pop-up). This was followed by a summer residency at The Rye pub in Peckham. This more permanent site is kept dark, even at the height of day, with neon lighting and grafitti-style artwork on all the walls. The entrance leads to a large square space, with booths around the edge of a sunken eating area. There are more (high) tables to the rear where the bar is located, as well as further tables on several levels near the bar, and seats along the bar itself. All food orders are taken at tables by the staff (who are dressed much like the diners, so can be hard to spot). The food menu itself is fairly short photo of menu in Nov 2011, mainly listing burgers, but also a few other dishes, including even some vegetarian options. Prices stick around £6.50-£7.50 for a burger, with fries and onion rings separate (£3 each). There's also an extensive and interesting cocktail list photo of cocktail menu and a few beers including Meantime London Pale Ale and London Lager, and a guest American (which was from Flying Dog on Ewan's November 2011 visit). Beers are served very cold and in frozen glasses. The food itself is certainly greasy, and both burgers Ewan tried here (the Dead Hippie and the Bacon Cheeseburger) were sloppy and messy to eat (though this was undoubtedly intentional), so plenty of the kitchen roll provided at all tables was required. The meat was cooked nicely, and my medium rare request did seem to be a little pinker, though it can be hard to tell in the low light. Fries were a little bland, but the onion rings were good (and big). At busy times (which are not infrequent) there can be queues out the door, and there is a strict no bookings policy, so everyone has to queue. Last visited by Ewan, December 2011. Last edited 2019-02-17 13:06:11 (version 12; diff). List all versions. Page last edited 2019-02-17 13:06:11 (version 12).